Quite early on Tuesday morning I received news that a Great Reed Warbler had been found at Radipole at Weymouth. I arrived by 0830 and immediately heard the characteristic guttural ‘kara kara gurk gurk’ of the Great Reed. It took quite a while before I saw the bird, I even got a scope view.This is a rare visitor to the UK, my 5th in the UK but only the 2nd in Dorset, interestingly that bird on 31/5/02 was in exactly the same locality. 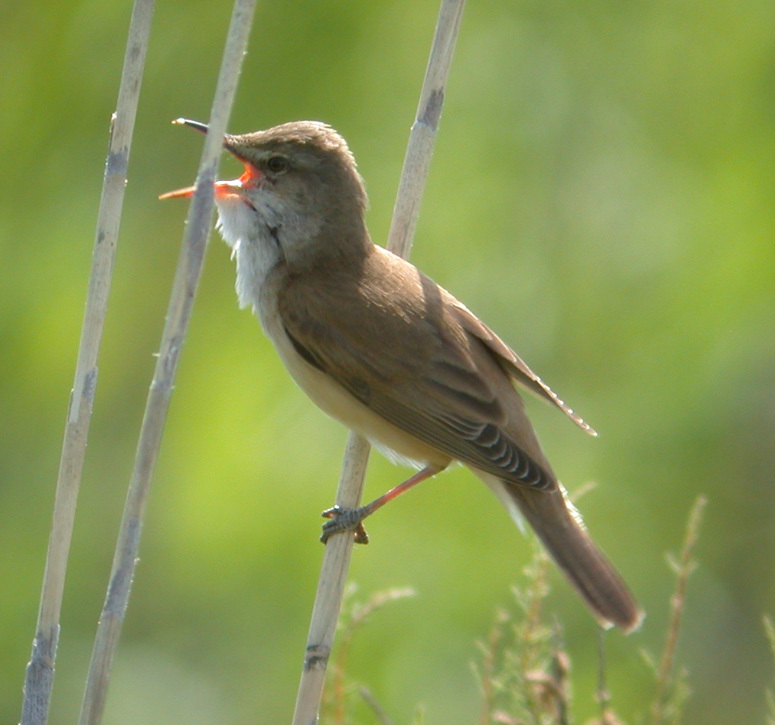 Click here for recordings of Great Reed Warbler’s gutteral song. I had left home without picking up a suitable sun hat. With the hot sun threatening to burn my ‘spam head’ I had no option but to wear a wooly hat that I found in the car to avoid sunburn. Talk about overdressed. The temperature later reached 27 C, 15 degrees hotter than this time last week! Great Reed Warblers are substantially larger than our familiar Reed Warblers, but are very similar in colouration and shape. … whilst the local Marsh Harriers flew high overhead. During the evening I returned to Martin Down with my friend and former colleague, Tim Kellaway. Tim has never seen a Woodchat Shrike in the UK but unfortunately it had gone but we had a pleasant wander seeing Turtle Doves, Red-legged Partridges, Whitethroats and Yellowhammers. A singing Reed Warbler was an unusual find in scrub habitat. There seems to have been a huge increase in Ravens in the area, we saw at least 30 and some have reported over a 100 in the area. Most were first year birds in pristine plumage which could be told from the moulting adults even when high overhead. Just four of the 30+ Ravens that flew over Martin Down, presumably to roost. A mixture of farmland, dense heges and chalk downland make the Martin Down area a haven for wildlife.